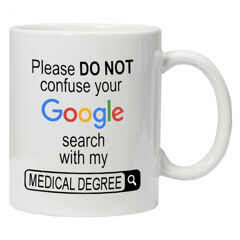 Don't confuse your Googling circumcision with my med degree! Have you ever tried to self-diagnose via the Internet? Got a rash? Go onto WebMD and plug in your symptoms. Turns out you have scabies. You might already be dead. The Internet gives us plenty of worst case scenarios, rare diagnoses, exaggerated claims, old wives tales and outdated information, all mixed in with legitimate information. Our own research may not give a clear picture, and sometimes we need the experienced eyes of a doctor or the technology of a lab test to figure out what is ailing us. Doctors’ practices and recommendations are very valuable, but occasionally they are based on culture, opinion, or just habit. For example, think of the old advertisements with doctors recommending their favorite brand of cigarettes as healthy and beneficial. Or how rocky a road it was to get doctors to wash their hands between autopsies and delivering babies. What kind of cigarettes does YOUR doctor smoke? It’s well-documented that open heart surgery was performed on babies with zero anesthesia up until the 80’s because the common belief was that babies couldn’t even feel it. If you look around the Little Images website, you’ll see that we take a position that circumcision is not necessary or beneficial for a child’s health, and in fact harms in many ways. It is unethical and ought not to be done to infants. Maybe your first reaction when hearing this, is “well, you can’t believe everything you read on the internet. If my child’s doctor offers it, it must have some medical purpose.” But what if your doctor considers circumcision an OK choice because of culture and habit rather than actually understanding the ethics and best practices surrounding the issue? Depending on when and where they went to medical school, your doctor may not know much about the natural anatomy and development of male children. Circumcision rates were high in the US when most doctors were growing up, so circumcised anatomy may be all they are familiar with. In fact, many American medical textbooks teach only how to cut off a boy’s foreskin, not how to treat even the most minor maladies associated with it. Many American doctors still advise parents to retract (=pull back the foreskin of) babies and toddlers for cleaning, even though medical organizations specifically advise not to. This common error from doctors can injure boys and introduce bacteria and infection where none would otherwise exist. Not only are some doctors not aware of how to safely care for intact (=not circumcised) boys, some also repeat cultural myths about circumcision as if they were undisputed. For example, you may hear from a doctor or other medical professional that the purpose of circumcision is to prevent infections. A meta-analysis of 12 studies concluded that it would take 111 circumcisions to prevent one UTI. That means that there’s really no net benefit in that area, as there would be a good number of complications with 111 circumcisions, and more importantly, those 111 people lose a healthy and important sexual and protective part of their anatomy. The supposed medical benefits of circumcision change every few years. It is clear that these medical benefits are post-hoc (=after the fact) justifications of a cultural habit. In other words, we’re already doing this and we want to find a benefit to justify it. Most countries have either long abandoned, or have never even practiced, non-religious infant circumcision. I encourage you to read the policy statements of those medical organizations. The published consensus of medical professionals worldwide, and many in the United States too, is that circumcision is far from necessary and not medically justified. Who will you believe? A handful of doctors who say “well, it’s your decision, there are pros like preventing infection,” or whole national organizations and countries that discourage and do not routinely practice circumcision? Someone without a medical degree is able to understand how a non-therapeutic surgery is, by definition, harmful. Without a clear medical indication, it’s not our call to decide how much body our child gets to keep. You can read more about how circumcision violates the principles of medical ethics here. We would never consider removing other healthy body parts from an infant. It’s hard to go against what seems to be “doctor’s advice” if your doctor says circumcision is beneficial or your son will be fine either way. Perhaps all the males you know of are circumcised (although the rates are dropping quickly in the US), and you’re unsure about keeping your child whole based on “something you read on the internet”. At Little Images, we are here to support you as you protect your son. We will answer your questions about caring for an intact boy. We can direct you to reputable information about any particular issue you’re concerned about such as penile cancer or phimosis. We are real people, not just figments of the Internet’s imagination. Among our staff and their families, the intact males have had no foreskin-caused issues over their combined 80+ years of life. None of them have ever had to even visit the doctor because of being intact. Medical evidence says keeping your child intact is safe and healthy – even safer and healthier than being circumcised. But remember, even without having read every study and statement, ordinary people without a medical degree can confidently agree: removing a healthy body part is an unneeded risk, unneeded loss of important protective and sexual functions, unneeded pain, and unethical.